Utagawa Kunisada/Toyokuni III (1786-1865) Actor Portraits Past and Present (Konjaku kabuki meiyu) 1863. Oban. This completely extraordinary print series was Kunisada’s crowning achievement and designed to cap his career with not only daring designs but also an extraordinary lavishness of printing. Examples from the series are not only rare, but are some of the finest known examples of Edo printing and design. The set was originally scheduled to include 150 works by the leading designer of actor prints Utagawa Kunisada; unfortunately it was never completed. Only 72 published designs are known, with 12 by Yoshitora, plus two proof prints and two preparatory drawings, for a total of 76 known compositions. Yoshitora joined the project in 1862 for unconfirmed reasons (possibly to assist an overworked or ailing Kunisada). The series was intended to be the crowning achievement in Kunisada's career, with no effort or expense spared in its size or production… In terms of their quality (beautifully executed block cutting, exceptional colours, embossing, and burnishing), the prints from this series are reminiscent of the deluxe limited editions produced in the smaller chuban format in Osaka during the mid-nineteenth century (most familiar among them are the prints of Hirosada). This remarkable and beautiful print looks forward to the Meiji period in its bold use of colour. These modern pigments would in years to come dictate the Meiji palette but in 1860 would have been startling and revolutionary. Equally startling is the largeness of the head in proportion to the sheet. Okubi-e (large head portrait prints) are generally credited to the artist Katskawa Shunko I (1743 - 1812); other artists excelled at them amongst whom Utamaro and Toyokuni I are outstanding. The format was banned by the shogunate in 1800 for around a decade but then started to creep back in popularity. This series by Kunisada revives the tradition but with the cropping of the margin even closer to the subject making a greater visual impact. As mentioned above, although frequently ignored, Osaka artists were frequent visitors to Kunisada’s studio and indeed pupils. It must be beyond doubt that Kunisada would have absorbed the tradition of Osaka printmakers to use similar compositions. This series by Kunisada also had a profound impression on the work of Toyohara Kunichika. The subject of the print is unknown. 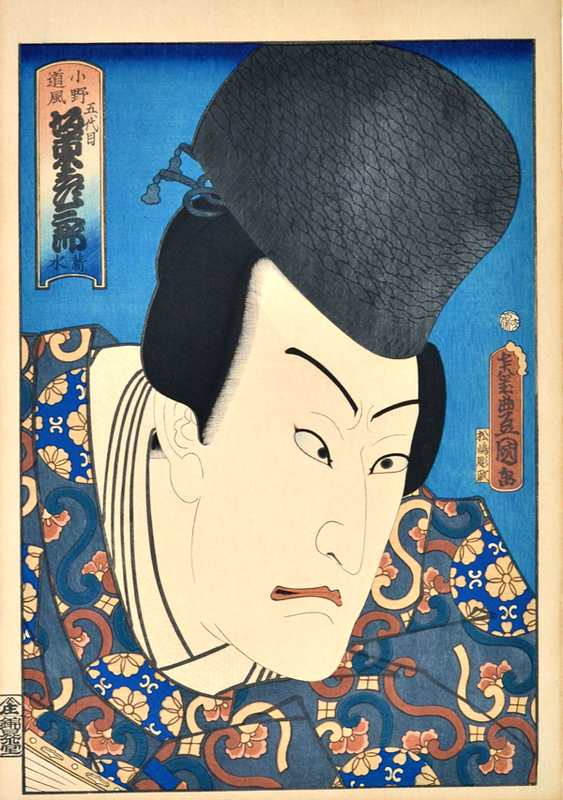 A kabuki actor in role stares angrily into the lower right hand corner of the print. The design, the block cutting and the colour of this piece are simply outstanding. As with others of this series, no expense has been spared with either the quality of inks, the number of blocks used or the specialist techniques employed. The hat here is deeply burnished with an interlace pattern, the collar is deeply embossed with blind printing. Colour, condition and impression are outstanding. Signed; nanajuhachi sai Toyokuni ga. Published by Ebisuya Shoshichi. Carved by hori ko Ryusan.